this is a game written in CL . It's very simple, but still better than the worm game for me. If you are curious about writting games on CL, and think the worm game too simple, you may check this. This game is developed under sbcl of linux, and I am not sure whether it could work under other platforms. You are TEAM BLUE and your job is conqure the RED TEAM . The small stuffs are your warriors! The grey ones are neutral guys, they are lovely and just don't attack. You can select one planet and see the LIFE of it (the bar at the bottom-right of the screen). 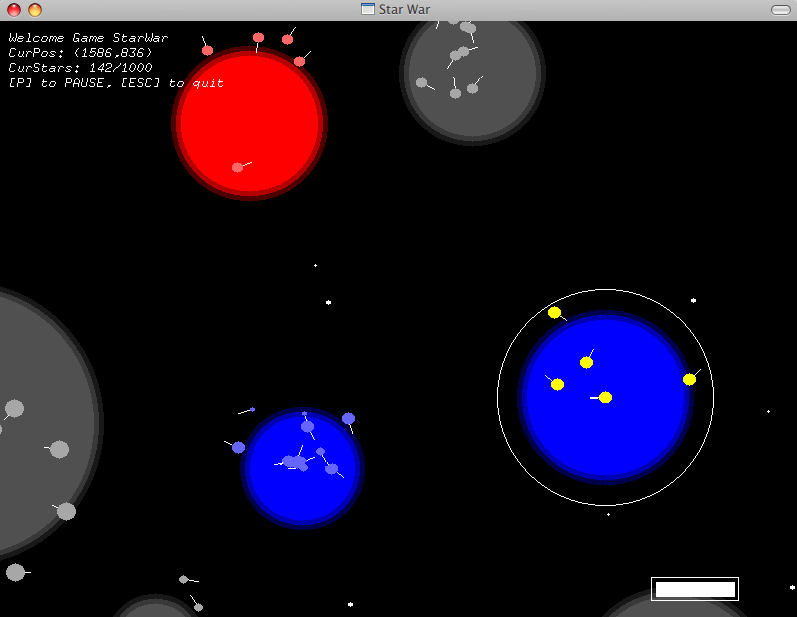 You can move soldiers by hold left mouse button on your planet and release at the goal planet. If your team is strong enough, the goal planet will be yours! All the source code can be downloaded at github here. currently, there are only binary for linux platform. Or you may go to the sbcl homepage. Quicklisp is commonly used in CL for installing packages. Refers to it's homepage to get and make it work. This will download, install, compile and load the required library. 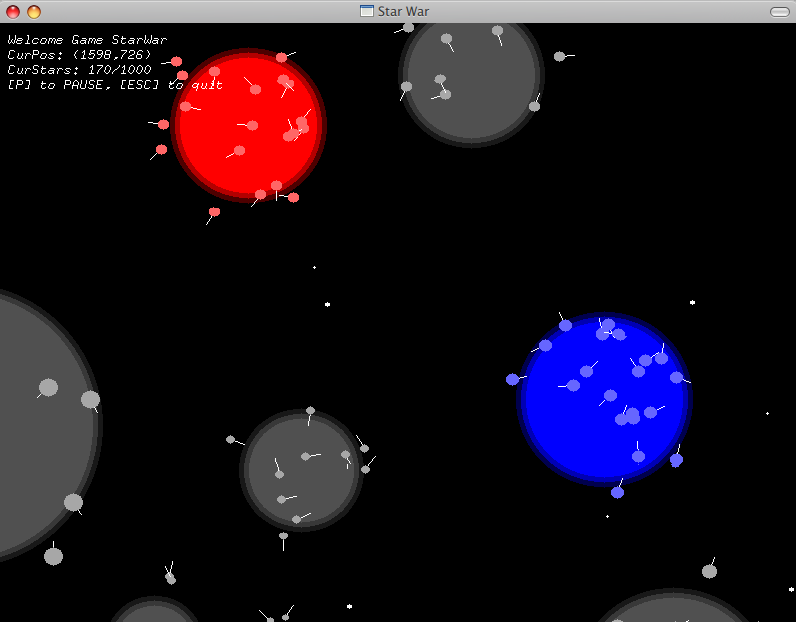 Without the lispbuilder-sdl-gfx, the game is workable but display uncorrectly. Then, libsdl-gfx1.2-4 possibly the required one. Here, PATH should be the path of starwar directory. Mostly use mouse left button to play. Single click on planets to select it; Hold the left button on your own planet, and drag it to another planet to make an path arrow to transport soldiers on the original planet to the target planet. All the maps in the game is auto generated. Blue is yours, and Red is the computer. 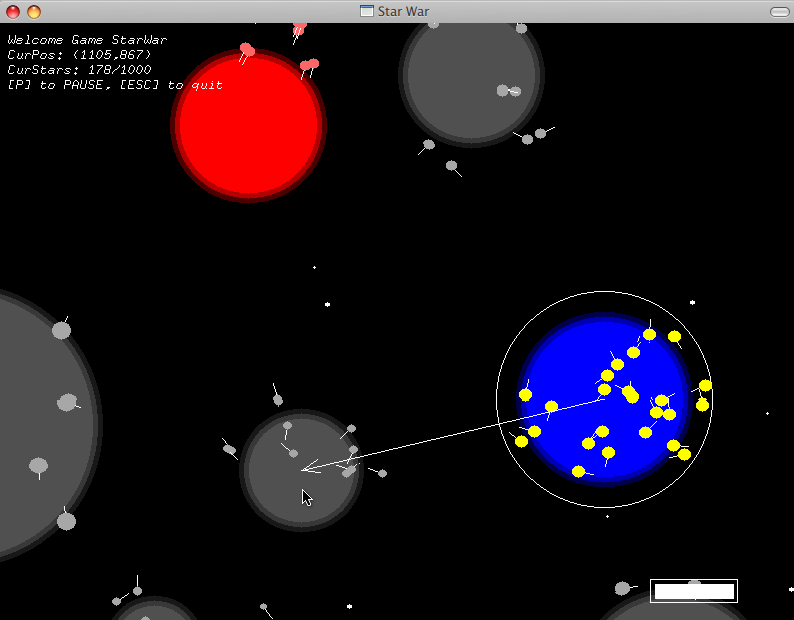 Try to eliminate all the Red planets! please contact google mail with id xzpeter.